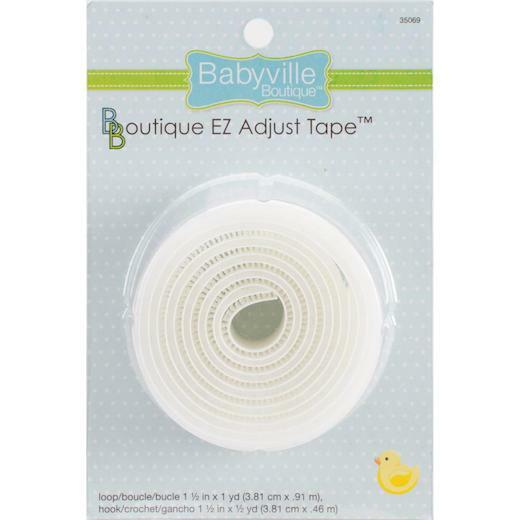 Babyville Boutique EZ Adjust Tape makes a quick and easy adjustable closure for diapers and diaper covers, bibs, diaper bags, apparel and other craft projects. Just secure EZ Tape with transparent tape to prevent shifting when sewing. Machine wash warm, tumble dry medium heat. Do not bleach. 100% Nylon. Sew in hook and loop tape. This package contains 1 yard of 1½ inch EZ adjust tape.